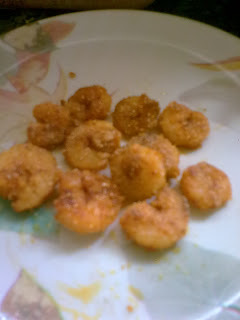 This is one of the most common prawn item you will find in every konkani home :-) It disappears in just minutes..Coarse rice flour known as aalen in konkani is actually used to coat the fish so that it gets crispy.Sooji/rava is a good substitute in case rice flour is not available. Marinate them with salt,turmeric and red chilly powder for atleast an hour. Roll them in coarse rice flour or sooji. Heat a non-stick tawa with some oil. Shallow fry the prawns on both sides till crispy. this is common at my place too.. i like rava though..